Under steady state, erosion rates are equal to soil formation rates. The fastest rates of soil formation occur in dune sands in moist environments, where weakly developed soils can develop over decades or centuries. For example, in Macquarie River, alluvium soils classified as Dermosols, Rudosols and Vertosols (see Table LAN3) have formed in less than 5000 years. Soil formation from weathering rock is slower, and varies with the environment and rock type. An average of about 10 millimetres per 1000 years is typical in New South Wales, increasing to about 75 millimetres per 1000 years in Arnhem Land, Northern Territory. These soil formation rates are low compared with the estimated global average of 114 millimetres per 1000 years (Stockmann et al. 2014). In Victoria, soil erosion declined between 1990 and 2010, probably as a consequence of the widespread adoption of soil conservation measures during the previous 30 years (Chappell et al. 2012). Similarly, in South Australia, soil protection increased between 2003 and 2013 in parallel with the increasing adoption of no-till methods (South Australian Government 2013b). Current rates of soil erosion by water across much of Australia now exceed soil formation rates by an order of magnitude or more. As a result, the expected half-life of soils (the time for half the soil to be eroded) in some upland areas used for agriculture has declined to merely decades. The latest assessment (Bui et al. 2010) concluded that soil erosion by water in Australian cropping regions is still at unsustainable rates, but there are large uncertainties about the time until soil loss will have a critical impact on agricultural productivity. Environmental impacts of excessive sedimentation and nutrient delivery on inland waters, estuaries and coasts are already occurring. Up to 10 million hectares of land have less than 500 years until the soil’s A horizon (the more fertile ‘topsoil’) will be lost to erosion. Most of this land is in humid, subtropical Queensland. A recent study (Bartley et al. 2015) compared long-term (between 100 and more than 10,000 years) erosion rates with contemporary erosion rates obtained by monitoring sediment fluxes over about 5–10 years in Queensland’s Burdekin River Basin. The ratio of these 2 erosion rates provides a measure of the accelerated erosion factor (AEF), which can be used to identify erosion hotspots and prioritise investment in land remediation at the subcatchment scale. All but 2 of the Burdekin subcatchments had an AEF greater than 1.0, indicating higher contemporary erosion rates than estimated long-term averages. Within the context of the Reef Water Quality Protection Plan, these results justify the setting of water quality targets at the subcatchment scale. More integrated studies of soil formation and erosion using a variety of techniques will be needed to better understand the extent, severity and significance of the problem. 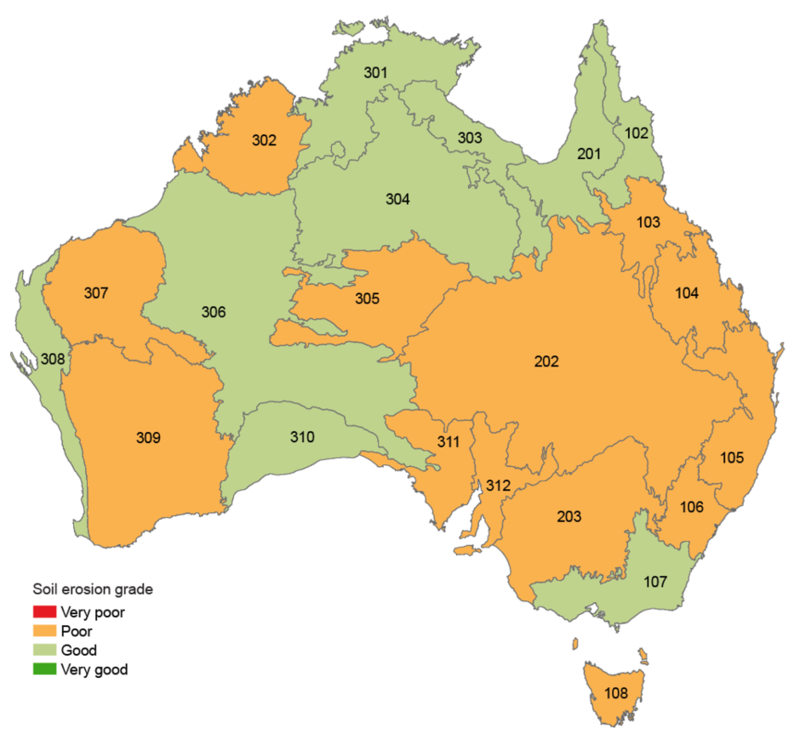 However, it is clear that a concerted program of soil conservation is essential to control this chronic form of land degradation across large areas of Australia. The key to controlling soil erosion by water is maintenance of a protective cover (e.g. living plants, litter, mulch) on the soil surface. Other soil conservation practices—such as contour banks, filter strips and controlled traffic—are important, but secondary to the maintenance of cover. Land management practices have improved significantly during the past few decades, as a result of better grazing practices, adoption of conservation tillage, enforcement of forestry codes and soil conservation measures in engineering (e.g. relating to road construction and urban development). an associated large decline in the amount of tillage in farming systems (Figure LAN21). 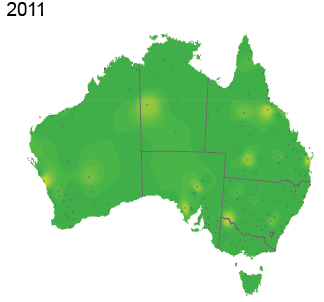 Figure LAN22 shows 2 images of Australia derived from remotely sensed data. The images show the proportion of bare soil and surface cover that is either photosynthetically active (i.e. growing vegetation) or inactive (e.g. crop residues, plant litter). 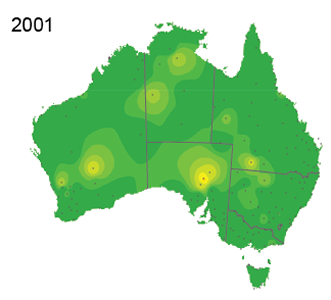 Figure LAN22a shows the Australian continent in 2006, during the millennium drought. Figure LAN22b shows the same seasonal period in 2015, after the drought had broken in 2010-11. Reductions in the area of bare soil are evident in the Central Lowlands Province, and the east and south-east of the continent. The intense rainfall and floods associated with the breaking of the drought resulted in widespread erosion, especially in south-east Queensland. A complete timeseries showing monthly images for the past 15 years is available on the SoE website, illustrating the pervasive effect of fire, especially across northern Australia. Source: The data underpinning this figure were obtained through TERN AusCover. TERN is Australia’s land-based ecosystem observatory, delivering data streams to enable environmental research and management. TERN is a part of Australia’s National Collaborative Research Infrastructure Strategy. Climate is by far the strongest determinant of wind erosion: soil that is wet or covered by vegetation does not get blown away by the wind. Land management can thus either reduce or increase wind erosion rates. Unravelling of the respective influences of climate and land management was made easier by the impacts of the millennium drought, which allowed comparisons between past and current management approaches, and of the effectiveness of different approaches to land management. 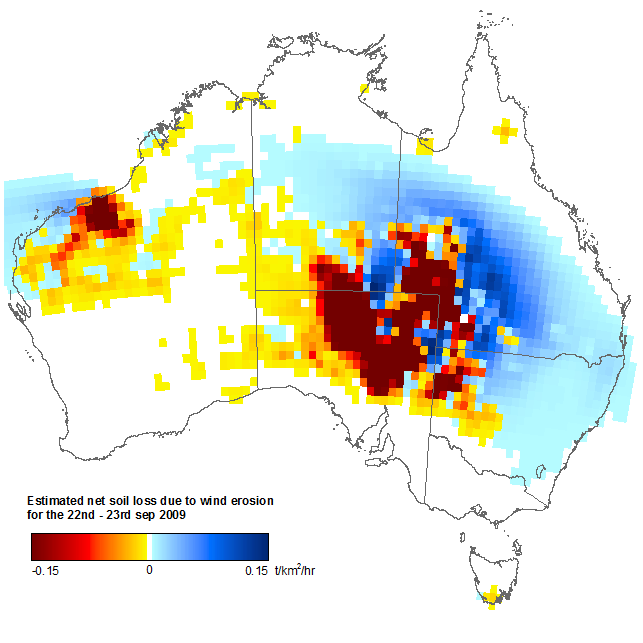 The millennium drought resulted in large dust storms and other wind erosion activity. 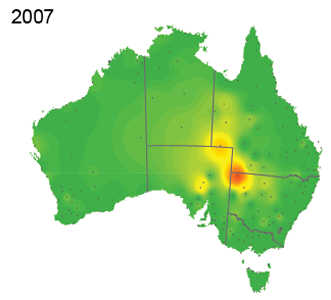 Two extreme dust storms hit eastern Australian cities on 23 October 2002 and 23 September 2009. 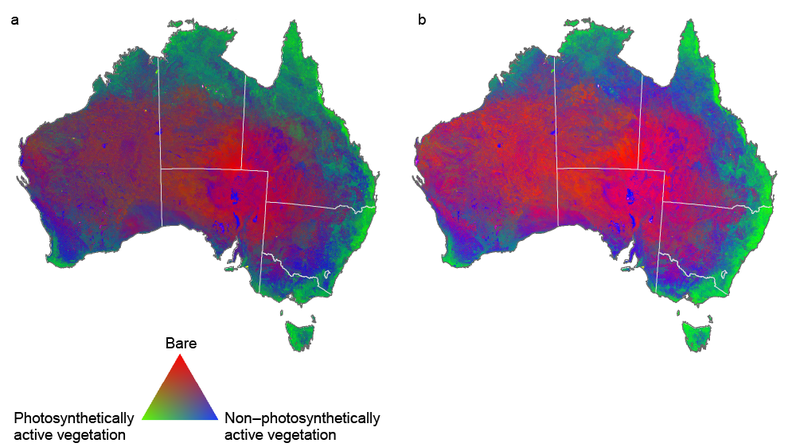 The origin of large amounts of windborne soil—in South Australia, northern New South Wales, and central and western Queensland—and the sites of deposition to the north and east, are shown in Figure LAN23. Wind erosion has environmental impacts at the source, where soils are eroded (onsite wind erosion), and much greater economic and human health impacts downwind from the source, where air quality is reduced (offsite wind erosion). These extreme dust storms increased public awareness of both these types of impact. Compilations of dust storm activity year by year (Figure LAN24) show that, although the sites of origin may be similar, annual climatic variation has an immense impact on the magnitude of wind erosion. 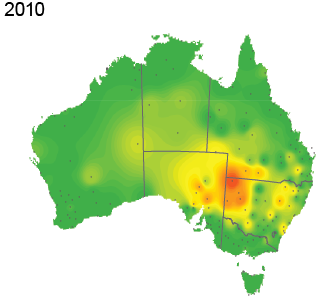 A series of 11 maps of Australia showing dust storm activity across Australia from 2001 to 2011. The dust storms are rated on a scale called the dust storm index, which starts at 0 to 1 and reaches a high of 45 to 55, shown in different colours. The highest levels on the scale tend to occur in a zone around the borders of South Australia, New South Wales, Queensland and the Northern Territory. The most intense activity across the largest are was in 2003. Years with very little activity are 2001, 2002 and 2011. Figure LAN25 and assessment summary 6 provide an assessment of soil erosion by wind and water across Australia. The assessment draws from the SoE reports for Western Australia, South Australia and New South Wales (NLWRA 2003, Bastin & the ACRIS Management Committee 2008, Bui et al. 2010, McTainsh et al. 2011, Chappell et al. 2012, Butler et al. 2013, Bartley et al. 2015, Teng et al. 2016).